How Much Water Should Men Drink? Home | About Us | Opportunities | Sponsorships | Contact Us! How Much Water Should Men Drink? 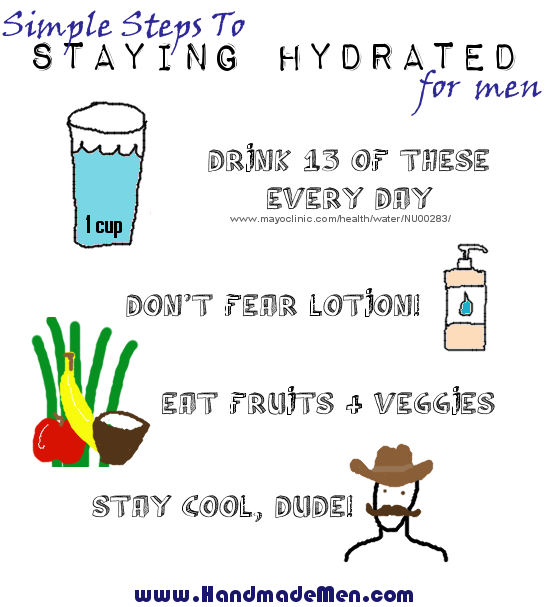 When it comes to getting enough hydrating, men need to pay special attention. Lots of guys wonder how much water men should drink, and the answer may surprise you! Grab your favorite refillable water bottle and absorb these facts! According to the Mayo Clinic*, the average man should be drinking about 3 liters (13 cups) of water every day. That may sound like a lot, but consider how much water you lose as you get things done each and every day! Sweating, using the restroom, and even breathing take water from your body, and it’s your job to make sure it gets replenished. Staying topped off with fluids is easy if you get a light-weight water bottle that you can keep with you at all times. Having a water bottle isn’t just ‘in style’ these days, it’s also a simple and effective way to remind you to get enough fluids. Enough water can help with weight, metabolism, mood, skin, and athletic performance – so don’t dry out! Avoiding disposable water bottles – even the recyclable kind – is a great way to do a serious solid for our environment. Instead of picking up expensive bottled water for stores (most of the cost goes to the bottle! ), invest in a refillable water bottle. You can find varieties in every color and style, and they’re super easy to personalize! Tagged how much water should men drink, hydration, mens water, water. Bookmark the permalink.